Interview: Daniel Radin of The Novel Ideas! Underneath This was pleased to interview Daniel Radin of The Novel Ideas. Please read more about the band in the brief bio sent us to by Daniel before checking out the subsequent interview. The Novel Ideas are a country folk quintet of friends from the great state of Massachusetts. Featuring the voices of three different songwriters, The Novel Ideas create a blend of pastoral, harmony driven, and plaintive Americana. They spent the past year playing shows in support of their debut album, “Home,” which was recorded in a barn in Jaffrey, NH. In June 2014 they released a 10″ single “Lost on the Road”, featuring two new songs and marking the band’s first effort as a five piece. 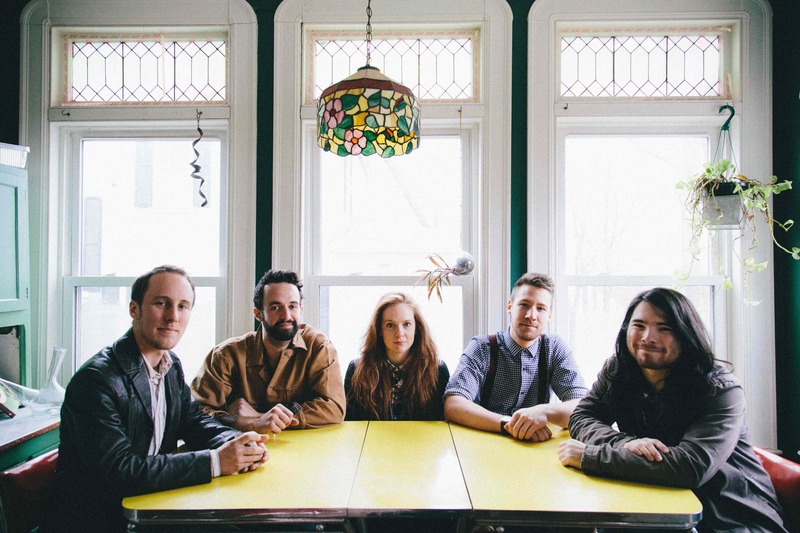 They’ve shared the stage with acts such as Lord Huron, Caveman, Little Green Cars, and are currently touring nationally and working on their next record. How did The Novel Ideas form? The Novel Ideas formed around an album that Danny (our guitarist) and I wrote and recorded in a barn in New Hampshire. The name comes from the fact that I used to be too shy to write songs about my feelings so I wrote songs about books instead. Of course, that has changed since the name was invented. In what ways does being in Massachusetts affect the music you make? I’m not sure that being in Massachusetts necessarily affects the music, but I know that living in a house of other talented musicians definitely does. We live with members of Photocomfort, Gabe Goodman, and Magic Man so there is always music being played somewhere in the house. Each of the three songwriters in the band have lots of different artists they look to for inspiration. Danny admires Jackson Browne, Sarah admires Patsy Cline and I admire Emmylou Harris. Those are just examples, but it helps our songwriting process because we’re each bringing something different to the table. Recently in the media, there has been discussion about the resurgence of Americana music. Where do you see yourselves within that movement? We hope to see ourselves in that movement period! Any genre is tough to break into but we’ve been lucky enough to get some support slots on shows with bands we really admire. Everyone in the scene is so nice too! How do your social identities affect the music you make? I’m sure our social identities do affect the music we make, it’s hard to say exactly how. In my own songwriting, I know that I can’t write down a lyric unless it was true. I’ve never been able to really sing something unless I really mean it. The band is composed of several singers and songwriters. How do you blend your talents so well? Our songwriting and arranging is very collaborative. We get together for practice and often someone will just start playing something that will turn into a song. We’ve learned that writing songs together is almost always better than writing in a bubble. We characterize it as Country Folk. Our new song, Lost on the Road, features Sarah on lead. She wrote this beautiful and sad verse and I had just written this sad but “I’ll get through it” type of chorus. I really love songs where the singer, male or female (but especially female), sings about how they have weaknesses like anyone else, but is trying their damnedest to be strong nonetheless. Saint Marie is a very true song but the lyrics came out mostly all at once. I wrote it in Italy while I was abroad and my heat had stopped working and I was wearing all the clothes I’d brought because I forgot to bring a coat and I was just feeling so low. Lonesome George is about the now deceased tortoise who was the last of his kind. The story hit Danny in such a way that he wrote a song about it. So sad! When I first saw the title of, “Heart of Stone,” I thought it was going to be a Cher cover! That being said, I love your song too 🙂 Do you ever perform or record cover songs? What would be a favorite one to cover? We do! We cover Angel from Montgomery by John Prine, Running on Empty by Jackson Browne and Landslide by Fleetwood Mac. They’re each sung by a different member and all super fun to play. What are some new projects for The Novel Ideas in the works? We’re planning a two tours and a time to record our new album. We’ll have more details for it soon but can’t say anything quite yet! You will be playing soon around the Northeast/Mid Atlantic. What have been some highlights of performing been so far? We have! One of our highlights from the last tour was playing in Lincoln, NE. The band we were on tour with couldn’t make it so we were headlining and ended up having a big, excited crowd in a city we’d never even been to before. That was amazing. My advice would be to surround yourself by others that you believe to be more talented than yourself and collaborate with them. You and your creative efforts will be better off for it. ← Interview: Benjamin James of Pluto Revolts!